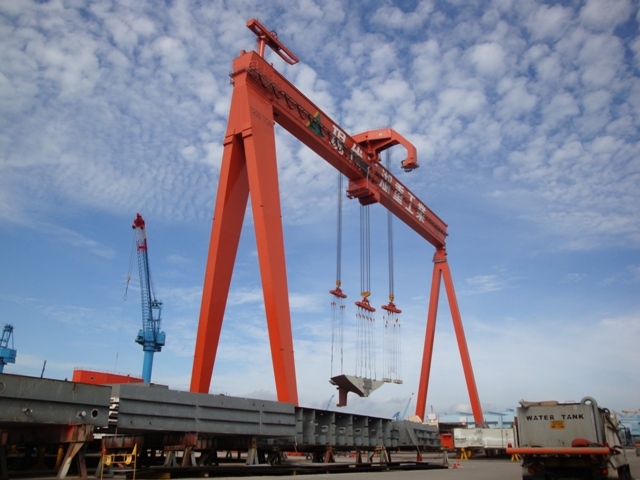 Gantry Cranes – Konecranes, Inc.
Gantry cranes are among the most widely used industrial crane varieties. They are very similar in nature to bridge cranes; the only substantial difference between the two configurations is gantry cranes’ mobility compared to bridge cranes. Both gantry and bridge cranes feature a beam that is positioned above the ground, parallel to the ground. Mounted on the beam is a mechanical hoist or winch that can move back and forth across the length of the beam. The winch lowers and retracts a hook or other lifting tool that can be attached to equipment below. At both ends of the beam is a support system. In the case of gantry cranes, that support system involves several beams that reach down to the ground. The beams can be mounted on wheels or casters, if the crane is mobile, and they leave the entire space beneath the parallel beam free for storage and for other uses. Bridge cranes differ in that instead of involving a single beam mounted on just a few beams, they feature one or more beams mounted on a frame, which allows them an additional axis of movement. Gantry cranes can be large enough for the movement of shipping crates across storage yards, and they can be small enough to suit small-scale, indoor industrial processes. Depending on the needs of a given operation, gantry cranes can be designed to feature very large, industrial-strength rubber wheels, or they can feature light-duty casters. Such details depend on the frequency with which the crane will be used, the operating conditions in which it will be used and the weight of the materials that it will lift. Like bridge cranes, gantry cranes can be designed to feature two load-bearing beams. The hoist or winch can be mounted between these beams, which allows the winch to be positioned farther from the ground at its maximum height. A common misconception is that this configuration increases the load bearing capacity of bridge and gantry cranes; in reality, it affects only maximum winch and hoist height. The distinction between bridge cranes and gantry cranes can be blurry, especially in the case of double support girder use. Generally speaking, all permanent, structurally supported parallel girder cranes are bridge cranes, and self-supported, occasionally mobile cranes are always considered gantry cranes. However, different crane manufacturers may have different standards, and different customers may have different expectations. Gantry Cranes Gantry cranes are materials movement tools that feature support beams and a winch or hoist system; they are used in industrial facilities and in construction projects for the movement of heavy or large objects.